Developer Grasshopper have truly created a very unique game on the Nintendo DS that is easily one of the most original stories and at times most original gameplay to have landed on the DS in quite some time. A combination of an adventure and puzzle game, Flower, Sun and Rain revolves around a man named Sumio Mondo who owns a 1970's car and has a briefcase called Catherine which can be used to connect to a wide variety of devices. Think Matrix meets the Nintendo DS. 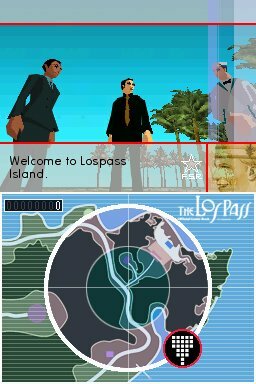 To compound the situation for Sumio Mondo, he is involved in a "terrorist" incident on the mysterious island called Lospass which is where his adventure begins. Interestingly enough the game has strong ties to the Matrix and also Groundhog Day where you must prevent a terrorist bomb from exploding aboard a plane which is also the "catch" to the story. This game is reminiscent of those classic point and click adventure games where you must interact with a variety of other individuals, solve puzzles, find items and of course find the clues needed to prevent this disaster. 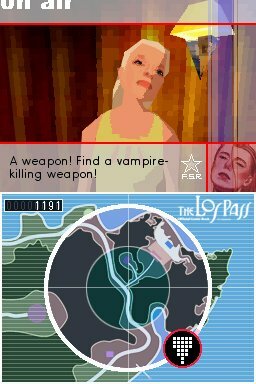 Whether your picking locks, opening safes or engaging in missions to find "items" for people on the island of Lospass, where the game does add something unique to the genre is via your briefcase called Catherine which does give a few twists and interesting elements to this genre. It also boasts some great mini-games which does break the monotony of the adventure genre. The strange aspect of Flower, Sun and Rain is the surreal "dreamlike" experience that has you engaged in a variety of bizarre activities that at times doesn't mesh with certain story elements which at the end of the day creates quite a bizarre and at times entertaining twisted tale. 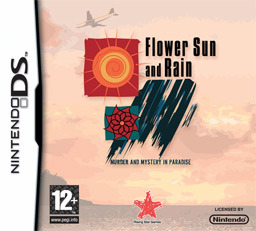 This is not to say that Flower, Sun and Rain is a bad game, however at certain points it can be quite confusing and distracting at times. The interaction with the gaming environment, especially from navigating throughout the different areas can be quite time consuming, especially for some of the tasks you have been given, whether it's finding an item for a wrestler or making a cocktail for a hotel guest, it sometimes fails to add up to why this will stop the terrorists. Thankfully your "briefcase" may hold the clues for Sumio the Searcher that helps our hero gain clues from objects and people as you "jack in", whether it's their psyche or those who have held the objects. 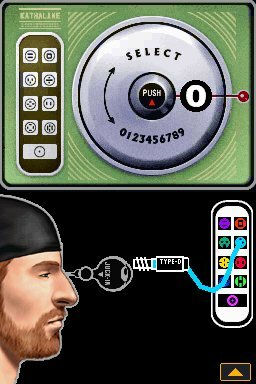 The control system is quite decent on the DS which can be controlled via the buttons or the stylus for better accuracy and gameplay. Needless to say, the Stylus is perfect for when you are attempting to crack locks or codes. Graphically, the title looks like your stock standard third party Nintendo adventure game that contains a good colour palette and some interesting graphics. I must admit that the introduction at the start of the game is quite impressive plus the dreaded "terrorist" attack on the plane. Strangely the game almost looks Grand Theft Auto-esq at times. Musically, the soundtrack suits the game quite well as do the odd sound effects here and there that at the end of the day, the game attempts to give DS gamers a truly different gaming experience. At the end of the day, Flower, Sun and Rain is an interesting premise on your classical adventure games, however I feel that Western gamers may find this a little immersive and surreal at times, however it's definitely value for money, check it out!